Just received the Konnected interface kit. 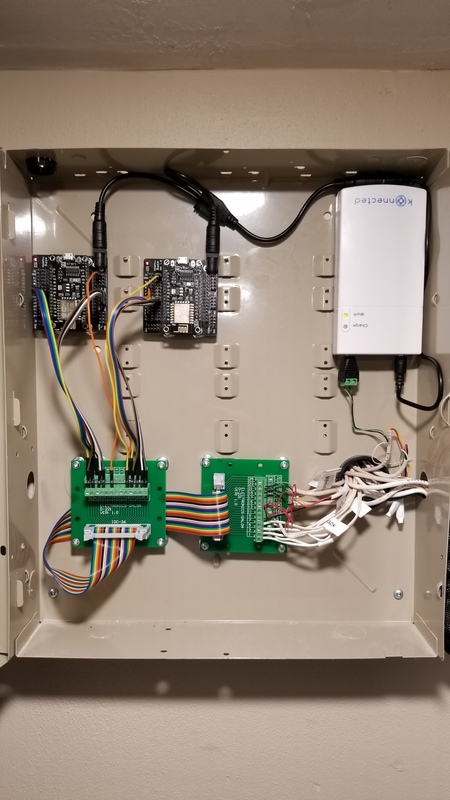 Wondering if anyone installed their Konnected module IN THE ALARM PANEL and if closing the panel door affected ( or would affect) the wifi board connecting to your router and seen by Hubitat hub. My router is on the other side of the wall in next room. 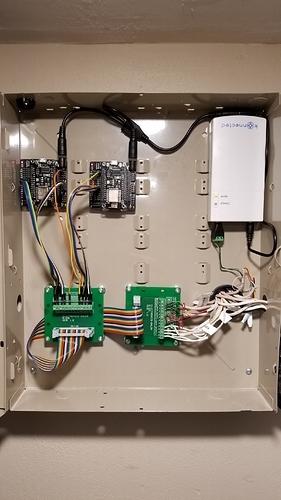 The wires to connect my zones to the Konnected module seem short and maybe tight if I put the Konnected module outside of the alarm panel. Also if you had any tips on Konnected interface working with Hubitat would be GREATLY appreciated. I replaced my alarm panel with Konnected boards - so not quite the same - but I did install mine in the alarm panel w/the doors closed. It definitely knocks down the Wifi signal strength (I looked before and after on my wifi AP), but it hasn't been an issue in my installation. Much appreciated! Have you setup Home Security monitor in Hubitat to tell you when a sensor was opened when armed away? Just trying to figure if this done by MODE, or rule. I can't use Konnected relay with my Honeywell Vista 20SE, so Konnected can't tell me if alarm system was tripped. I use HSM for my security/perimeter alerting - yes. Working great. I just bring in/monitor all of the raw alarm inputs, since I replaced my alarm panel entirely. I use mode manager to sync HE Mode and HSM state/mode. Has been working well for ~6 months. Ok! I think I got it lolo. New to Hubitat so just getting familiar with HSM capability and using MODE, but sure I'll be able to figure it out. Thanks again! No worries, and feel free to ask questions as they come up. There are a lot of bright people on here willing to help. This truly is a GREAT community and I've seen first hand, how everyone jumps in to help each other. You can check the WiFi signal strength of the Konnected module if yo7 click on it under your app list. You can open and close the door to see what difference it has on the signal strength. Ahhhhh, great! I'll definately do that. THANKS! 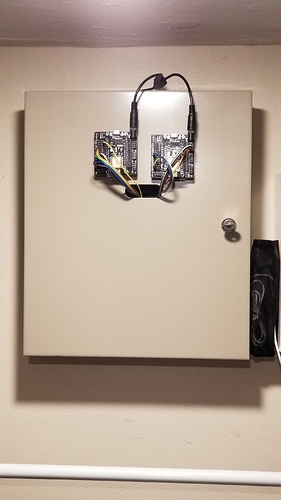 I put mine in the alarm a cabinet, with metal enclosure. The panel is in the attic and about 20 ft to the wifi router, which is in the living area. Signal strength is about 72% and no issues. I initially had mine in my panel. The signal was adequate but I wanted my signal to be at least in the 70's at all times. I ended up getting the magnetic standoffs that Konnected sells and mounted it to the outside of the box. I have recently upgraded my router and forgot to check these....so I think I'll move them back inside this afternoon. Thanks for the reminder. Didn't help much in my case. I tried that first and ended up moving them outside. Signal jumped into the 80's. Mine is in the metal-door panel in the closet, and my AP is about 10 feet away. I have never worried about signal and it has been perfect for 3 months except after one HE update that caused me to change some rules. I have the buzzer run to the old alarm keypad casing, and I have a rule to beep on every open. The latency to beep is consistent at about 1/2 second. Gonna install in the alarm box first then check the wifi signal. Seems like slight degradation of Wi-Fi signal may occur but not enough to matter. If I do run into problems, I'll handle it then. Thanks! Mine are back in the panel and getting 90% and 88% so I'm good to go. My wife is happy she doesn't have to look at them in our bedroom closet anymore. Edit: just rechecked and I'm seeing 100% and 94%. Lolol, I'd hear the same from my wife if I put the Konnected outside of the box in our closet. Glad your getting a great wifi signal. I'm waiting for a Konnected interface replacement. They sent me one with the potentiometer missing on zone 6. I couldn't believe it when I went to install it. I am seeing 62%, 60%, and 50%. All 3 work fine though, so it's not something I worry about or watch closely.